When you sit at blackjack table it is not always good to joke about the game but it does not mean that gamblers do not have any funny stories and situations to tell about their favorite casino game; even when you play for serious money it is unnecessary to stay serious all the time: such a phenomenon as fun blackjack also exists, and it makes blackjack game being even more interesting and exciting for people to try. 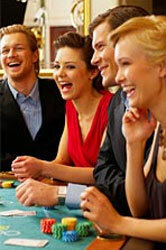 You are welcome to read the funniest blackjack jokes of gamblers; there are a lot of them can be found but it is impossible to tell all of them in one article of course. -Why should I leave tips to a dealer if the cards he deals me do not depend on him? -Well, sir, when you are in a restaurant, do you give tips to your waiter? -But he does not cook the food you eat there, so, the food you eat there also does not depend on him. -Well, he gives me what I want at least! May I have an 8's then? One man goes to Las Vegas with his friends and wins $100 000 there. He does not want his friends to know about his big winning and decides to come back home later by another plane. He digs a hole at his backyard and buries his winning there. The next morning he sees that the hole is empty and all money is gone! -Tell this deaf man that if he does not tell me where he has hidden all my money I will kill him right now! The professor translates his words to this deaf man and gets the answer: "I've hidden that money under my cherry tree!" -You know what? - replies the professor, - This deaf man says he would rather die than tell you where the money is! Never ask a blackjack dealer whether s/he knows any interesting and exciting tricks with cards! I write you this letter to tell that I was wrong. I was not right when told you all those awful words concerning your hobby. I miss you very much and want us to try again. I hope you'll give us the second chance and everything will be ok between us! P.S. My congratulations with that big blackjack winning at Las Vegas last week!